Death has come to your little town! 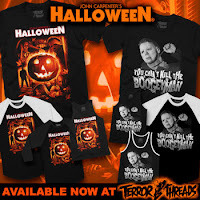 Terror Threads celebrates the night he came home with a collection of John Carpenter's Halloween apparel. A whopping 16 exclusive, officially-licensed Halloween shirts are for sale, ranging from newly commissioned artwork to vintage production stills turned into unique shirt designs. 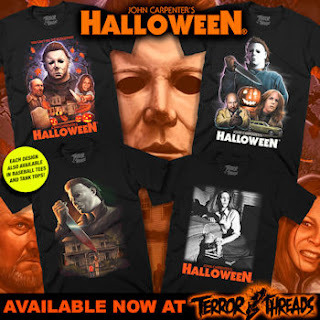 Michael Myers, Laurie Strode, Dr. Loomis, the Myers house, and more iconic imagery from the 1978 horror classic are all accounted for. 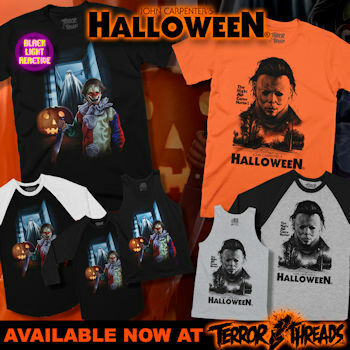 Every design is available on men's T-shirts, women's T-shirts, tank tops, and baseball tees. John Carpenter's Halloween collection is on sale now at TerrorThreads.com.